Image quality is the hidden cost of check processing that many don’t think about until it’s too late. 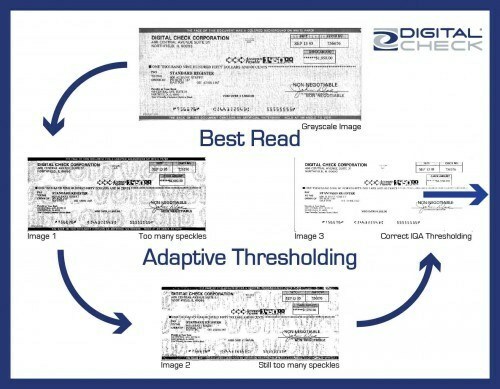 According to Digital Check’s Image Quality white paper, the cost of keying in an image that cannot be read by the system is only 2 cents per item, yet these items make up nearly 20% of all items processed. The more challenging issues are those items that have cleared the system and have to be researched and corrected. These items, though they account for only 0.03% of all items processed, cost from $15-$25 per item to correct. These can add up to serious costs to the check processing system. Best Read technology creates the highest quality image using Adaptive Thresholding™. Improves image quality resulting in less keying and corrections. Special Document Handling optimizes the image quality results from difficult money orders and other documents. Utilizes FSTC IQA thresholding standards for the highest quality images. One size does not fit all, especially when it comes to creating clean check images. The reason is that checks vary in backgrounds, in color, and in the ink used to write on them. This is why Digital Check created Adaptive Thresholding so that even though the input varies, the output should be consistently good. Many documents can be a challenge to threshold, but some are made to be difficult, especially money orders. We call these “special documents” and for those we use Special Document Handling, a unique feature that produces high quality images every time you scan them. The hidden cost of electronic check clearing is the cost of poor images. Although Digital Check makes highly reliable scanners, we especially shine when it comes to producing great looking images that are more likely to clear without human intervention, reducing the overall cost of processing them.